Happy Halloween, Ghosts and Ghouls! I may call myself a housewife, but I don't just do housework- I also work from home. Usually that means I curl up on the living room couch with my laptop and my pup for the day (no bonbons). It's cozy, but it's hard not to be distracted by the laundry machine, the plants that need watering, the carpet that needs vacuuming, and the siren song of the TV ("I'll just turn on Oprah in the background"). By the end of the day when my husband, JM calls to say he is on his way home, I look around the room and discover that there are magazines, coffee cups, papers, lunch dishes, bills, and craft projects everywhere, which I then scramble to put away (and try to remember where I put the next day). 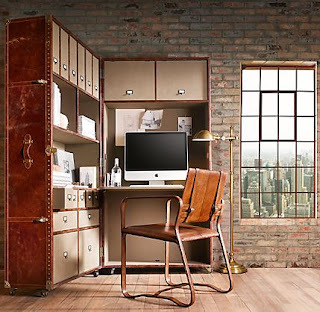 Lately, I have been dreaming about having a real home office, where my stuff could live all the time. 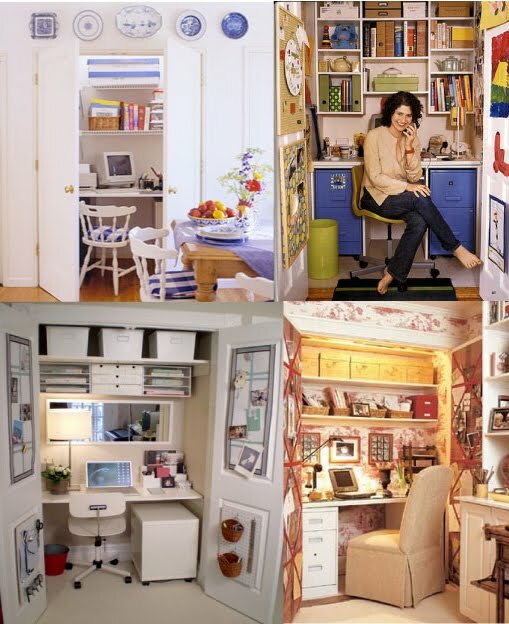 Since I'm not exactly swimming in extra bedrooms, I have started thinking about converting a closet into office space, or a "cloffice," if you will. I'm not exactly swimming in extra closets, either, but I feel that with a little consolidation and purging, I might be able to pull it off. I've gathered some cloffice inspiration (as well as a dreamy office-in-a-trunk from the new Restoration Hardware catalog that I could neither afford, nor get up the stairs to my apartment). 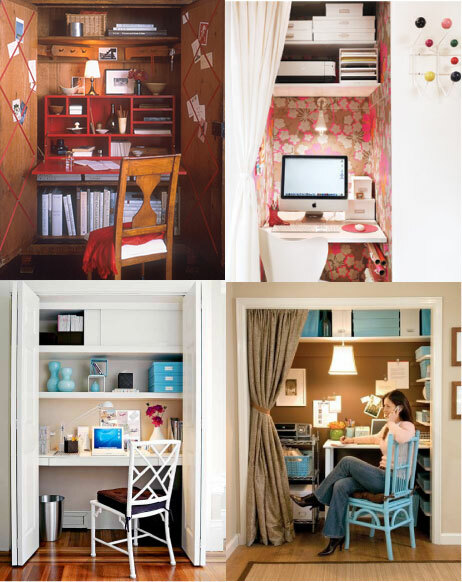 I love the idea of wallpapering the closet to make it feel like it's own distinct space, and a ton of shelves would be great for all my office and craft supplies and magazines. And there's nothing like staring into a closet to keep you from getting distracted. 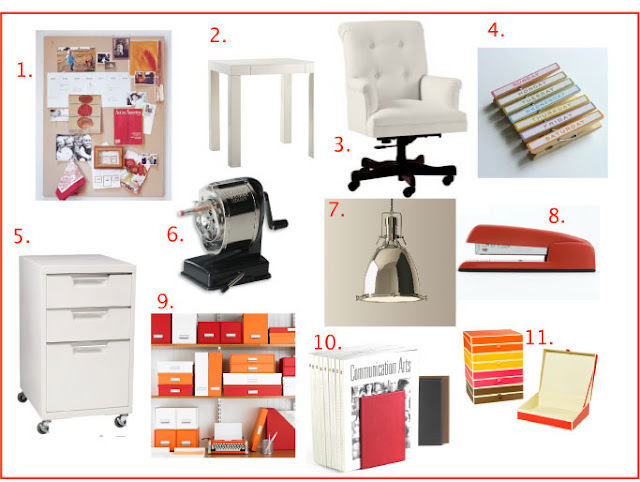 Here's my inspiration board for my cloffice, including a pinboard for inspiration and ephemera, a pretty glossy white file cabinet, a comfy chair that will roll into the closet when I'm not working, and an "Office Space"-approved red Swingline stapler. 1. Linen-covered pinboard, $149, from Pottery Barn; 2. Glossy white Parson's desk, $250, from West Elm; 3. Upholstered office chair, $500, from Ballard Designs, 4. Day-of-the-week Clips, $9, from See Jane Work; 5. White rolling filing cabinet, $150, from CB2; 6. Old-fashioned chrome pencil sharpener, $40, from The Container Store; 7. Chrome pendant lamp, $240, from Restoration Hardware; 8. Red Swingline Stapler, $21, from See Jane Work; 9-11. Portofino organizing boxes, magazine holders, and bookends, $10-25, from The Container Store. As I've mentioned before, each week my farm share has been unloading a preposterous number of pears on me. I mean, I know it's fall and they really are delicious, but the pressure to find ways to use them all before they go bad has really worn on me. Some of my creations (like roasted pears and sweet potatoes with cayenne and ginger) have been less-than-wonderful, but some (if I do say so myself) have been pure deliciousness. One recipe that fell into the latter category was the Pear Clafoutis I made for a friend's dinner party. A clafoutis, for those who don't know, is a French dessert composed of fruit set in custard, and, while it seems very complicated and elegant, it is actually very easy to make. 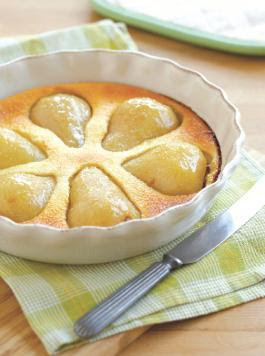 Taste-wise, it's basically what you would get if a pear tart and a crème brulée had a baby (oh, baby!). And it's so much fun to say: Clafoutis! I followed the Barefoot Contessa's recipe, which worked very well (that Ina never lets me down), but you can adjust the amounts, and use whatever fruit you happen to have available to you (I might try an apple clafoutis with the bags of farm share apples piling up in my kitchen). Whatever you use, I guarantee it will have your tastebuds exclaiming, "Rooty Tooty Fresh Clafoutis!" Preheat the oven to 375 degrees F. Butter a 10 by 3 by 1 1⁄2-inch round baking dish and sprinkle the bottom and sides with 1 tablespoon of the granulated sugar. Meanwhile, peel, quarter, core, and slice the pears. Arrange the slices in a single layer, slightly fanned out, in the baking dish. Pour the batter over the pears and bake until the top is golden brown and the custard is firm, 35 to 40 minutes. Slice like a pie, and serve warm or at room temperature, sprinkled with confectioners' sugar, and creme fraiche. Die and go to Pear Heaven. While it may seem like I run my mouth off without much inhibition, I actually have a major phobia of a certain kind of public speaking: the premeditated kind. In college, I had no qualms about asking questions off the cuff in a lecture class in front of 200 people (you know, when I showed up), but put me in a small seminar class with ten people and ask us to go around in a circle and introduce ourselves, and by the time it's my turn, I will be sitting in a puddle of sweat, and barely remember my own name. And the anxiety and nervousness is directly proportionate to the length of time I am anticipating giving the speech. So I am intimately aware of the particular brand of stress that giving a toast can bring. 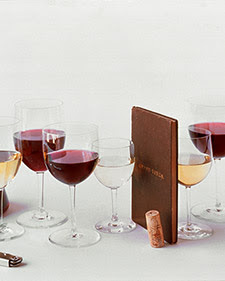 It's one of the downsides of having friends and family that you care about (that and having to remember birthdays), that eventually, you will likely have to raise a glass and say a few words in their honor, be it to your hosts at an intimate dinner party or the couple at a large anniversary party or wedding. It's a cruel, cruel world. 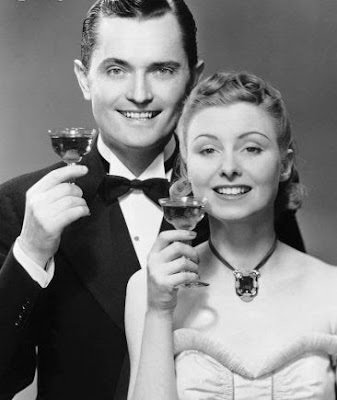 But giving a toast needn't be all that anxiety-producing (or, at least, no one needs to know how apprehensive you are). Just follow these simple rules, and you'll properly honor your friends and make new ones left and right, who will, in turn, request you make toasts at their special occasions. It's a vicious cycle, so you might as well get comfortable with it. Act Confident. Even if you are shaking in your stilettos, do your best not to let on. Speak clearly and loud enough for your voice to carry to the people in the back. It doesn't matter how great your toast is if no one can hear you, or they are too distracted by your shaky voice and sweaty brow to pay attention to what you're saying. No matter how tempting, don't turn to liquid courage; have no more than one drink before your toast- trust me, there is nothing worse than a drunk with a microphone. Lastly, try to remember that everyone present loves the honoree(s), and wants to see them properly honored. They are looking to you to do that, and rooting for you, and wishing you success. Be Prepared. Give yourself time to think about what you want to say. Write down your ideas and form an outline. Practice what you want to say in front of the mirror. But, when the big day comes, try to work from just notes and fill in. Reading your toast off a sheet of paper comes off as amateurish and it's hard to make eye contact and a personal connection when your eyes are glued to a piece of notepaper. A good general outline: 1. Introduce yourself and your relationship to the honoree (this is unnecessary at gatherings of less than 25 people). 2. Express your happiness and pleasure at being able to speak at the event and thank your hosts. 3. Tell a cute or meaningful anecdote in the spirit of the occasion, ideally one that paints the honoree in a positive light. 4. Raise your glass, and ask everyone to join you in toasting the honoree. Done and done. Brevity, Please. Seriously, your entire toast should be no more than five minutes at a wedding, and no more than two minutes at a more intimate dinner, people. Time yourself when you're practicing to make sure you don't go on too long. I lied before, there is something worse than a drunk with a microphone - a drunk with a microphone for twenty minutes. Keep It Clean, Sincere and Positive. No matter how funny a story you have about the groom from the bachelor party, this is not the place for it. This should go without saying, but stay away from any "blue" content, swear words, politics, or anything controversial or potentially offensive. Humor is great, but keep the content positive and warm. Remember- it's a toast not a roast. I'm a big fan of the interweb, and the various gifts it has bestowed upon us: Twitter, Youtube, Facebook, Seamless Web, online shopping, Wikipedia, and (ahem) blogs, among them. But one way my quality of life has deteriorated since the advent of Al Gore's brainchild is that, with pictures of every wedding and event I attend showing up on Facebook, I find that I can't wear the same dress more than a couple times until it seems like everyone has seen me in it. And with eight weddings this summer, all those new dresses can really add up. Luckily, thanks to the lovely ladies at Rent the Runway (including my friend, Jenn), the internet is about to resolve this particular problem, too. Rent the Runway has dresses from designers like Lela Rose, Proenza Schouler, Tibi, and Philosophy di Alberta Ferretti (as well as many others) available to rent for a fraction of what it would cost you to buy them. And if the only designer things your budget allows are the Target and H&M versions, here's your chance to try the real thing and live like a celeb for a weekend. 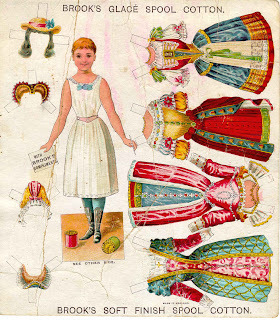 Just choose the dress you want to wear and it's yours for your choice of four or eight days. Rent the Runway sends you two sizes to ensure you always get the perfect fit. And each dress comes with a pre-paid return envelope, so once you've worn the dress, you can just drop it in the mailbox to send it back. Genius. 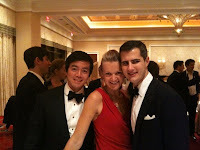 Here I am in a Yigel Azrouel number at an event in Las Vegas this weekend. While I would never splurge on something this daring, and, well, red, in real life, I loved getting to wear it for one night. And now it's on it's way back, and I'm back on the site, choosing what I'll be wearing next! The full site launches November 1, but sign up for membership now at www.renttherunway.com, and check out a preview of just some of their dresses now at www.renttherunway.com/prelaunch. But what happens if you have people coming over any minute, and you suddenly realize that because you live in New York City, where kitchens are required by law to be ridiculously tiny, you didn't have space in the fridge for the food, and the wine, and now you have no cold white wine to serve your guests? Not that I've ever had that happen... You could pop that wine in the freezer, wait 45 minutes or so for it to chill, and hope you don't forget it's in there in the meantime. Or, you could try this trick which chills your wine much more quickly (think 15-20 minutes), looks festive, and doesn't require you to use a screwdriver to hack all the ancient bags of frozen peas out of your miniscule freezer. So take a deep breath and remember to chill. 1. 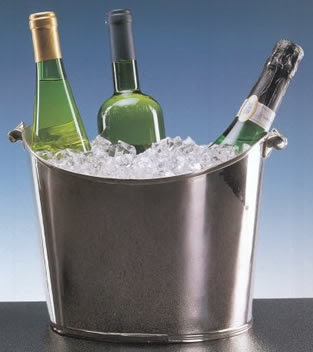 Grab a pretty ice bucket, or any bucket you have lying around. If you don't have a bucket you can use a mixing bowl, but you should probably think about getting an ice bucket, dude. Fill the bucket half way with ice. Pour cold water over the ice, up to the same level. 2. Throw in a couple handfuls of salt. This makes the ice melt faster, and actually gets the temperature of the water lower than that of ice. It's science, see? 3. Submerge the wine bottle in the bucket for 15 or so minutes. Enjoy! On our honeymoon, my husband, JM, and I treated ourselves to an incredible dinner at one of the most swanky restaurants in Paris (the fact that I just called it "swanky" shows you how well I belonged there). Waiters outnumbered the patrons 4 to 1, the silverware probably formerly belonged to Napoleon, the ladies were in ballgowns, and each table held a candelabra that wouldn't fit through the door to our apartment. At this dinner, we watched (mouths agape, I am sure) as the elegant couple at the table next to ours (who definitely belonged there) received a bottle of wine that emerged from the cellar covered in cobwebs and dust, clearly older than time. We did our best not to stare as they drank away a bottle that probably cost the same thing as the down payment on our apartment. Now, me, I'm not so picky when it comes to my libations. As long as it doesn't take the enamel off my teeth on the way down, I'm not going to complain. But that doesn't mean I can't tell a fine vintage from rotgut. It just means that I'm cheap and for my purposes (unwinding and washing down whatever it is I happen to have whipped up in the kitchen that night), there are multitudinous wines on the market for less than $15 that do me just fine. I'll admit- I'm no sommelier, and I get that when it comes to wine, people have as many different tastes as there are varieties of grapes. I happen to like my reds on the lighter, dryer side, and my whites crisp and not too sweet. 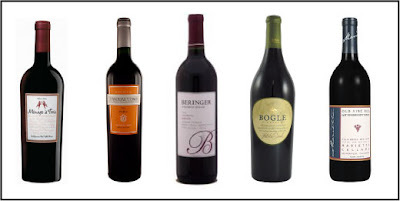 Here are my selections for a few great easy-drinking, crowd-pleasing wines that are widely available and won't break the bank if you're serving a group. As an added bonus, you probably won't have to wipe off any cobwebs. 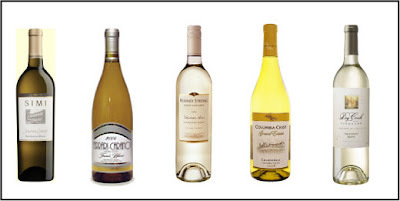 For more cheap, delicious wines, check out the selection at your local Trader Joe's, Whole Foods, Best Cellars, or even Cosco, where they have a great selection of inexpensive wines. Sorry, observant Jewish readers -- you should feel free to take a pass on this post -- but I am a newly-converted fan of pork. I've been dying of boredom cooking the same nutritious mostly-vegetarian meals over and over this summer, while JM and I have been on a health kick. For crying out loud, I thought to myself, I am training for a marathon- I need protein! So, last night I went to the grocery store seeking salvation in the meat aisle. The chicken breasts and ground beef looked fine, but a little predictable and uninspiring, and I made my way a little further down the aisle, to the corner where I seldom venture. Suddenly, the clouds parted, the angels sang, and a beam of light streamed down upon the pork chops. Okay, maybe it was just the bad fluorescent lighting and the piped-in muzak, but still, those chops spoke to me. And to sweeten the deal, I had no idea how cheap pork is (I got three chops for $4.50!). Being a pork-preparing novice, I turned to my old friend, the Everyday Food cookbook, for instructions. Turns out pork is not just cheap, it's also super easy and quick to cook. It should also be noted, for the paranoids in the crowd, that, unlike Mad Cow disease, eating pork does not in any way increase your chances of contracting Swine Flu. So pig out and go hog wild! Pour two tablespoons olive oil into a skillet over high heat. 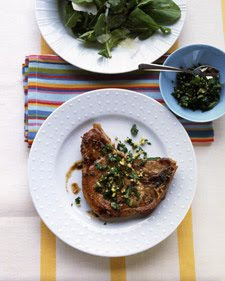 Season both sides of your pork chops with salt and pepper. Place chops in the skillet and allow to cook until one side is nicely browned, about 2-3 minutes. Flip chops and brown the other side (another 2-3 minutes). Carefully add 1/2 cup water to the pan, and bring to a boil. Allow to cook for 5-8 minutes, or until chop is cooked through (but try not to overcook and the meat will get tough). Serve with pan juices. I also topped mine with minced garlic, lemon rind and parsley (deelish), but for a more classic and autumnal take, serve it with roasted apples or applesauce. 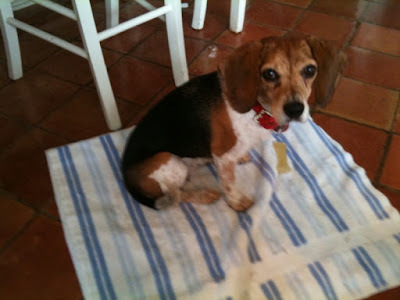 Our beagle, Skipper, has a lot of things going for her: she's smart, super cute, very friendly, quiet, and funny. But she does have a couple of faults over which she has no control: She sheds, and sometimes she smells like a hound. To keep this unpleasantness in check, Skipper gets daily brushings and weekly baths, and I have worked hard to find the right tools for the job. If you, too, have a malodorous or hirsute pooch or kitty leaving a trail of fur or funk wherever she goes, read on to find the best products to keep the yuck to a minimum. I use two brushes on Skip's coat one for removing loose overcoat hairs, and the other for pulling out the loose undercoat. In combination they work like a charm, and you will be shocked at the amount of hair that comes off your pet. As a bonus, Skipper loves getting brushed and can't get enough of it. 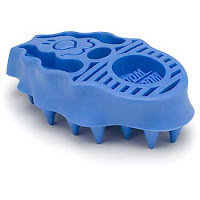 For the outercoat, I use the Kong ZoomGroom brush, $8, available from Petco. It is made out of rubber and attracts the hairs like a magnet. 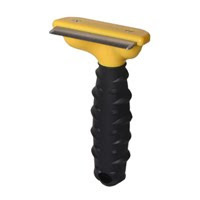 For the undercoat, I use the Furminator deshedding tool, $30, also available from Petco. This thing works so well you might be grossed out by the amount of hair that comes off your pet. 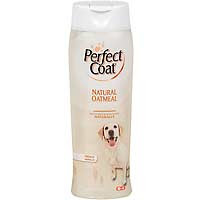 For her bath, I use Perfect Coat Natural Oatmeal shampoo, $7, also from Petco. I have tried more expensive brands, and this one seems to work the best: It moisturizes her skin, makes her coat super shiny, and smells great. 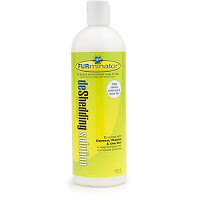 Lastly, she gets a rinse of Furminator deShedding Solution, $13, from Petco. It makes whatever is left of her loose undercoat come out and leaves her clean, shiny, sweet-smelling and shed-free. I come from a family of game-players. It is clearly one heck of a dominant gene- we don't all have the same physical build, or taste in music, or even the same sense of humor, but across the board, everyone in my family loves to play games. We play them in our socks, we'd play with with a fox. At night or during the day -- we play, we play, we play! And one of the games we play the most is a dice game called Crappy Malappy. It was taught to us by a friend of my brother's years ago, and we have played it ever since, though we don't always agree on the exact rules. But in the years since, I have never encountered another person who knows how to play, or who had even heard of it. So why not share this wonderful game with the world? Or at least with the small part of the world who count themselves among my readers. As a bonus, hopefully this will put to rest any rule disputes that might arise among my family. You know, now that it's been published on the Internet. I know it looks complicated, but try playing, and you'll pick it up quickly. The object of the game is to score 8000 points (although you can play to 5000 for a shorter game, or 10,000 for a longer one). Players take turns rolling six dice to score points. There is no limit to the number of players in a game. To determine the order of play, each player rolls one die- the highest roller gets to go last each round (which is an advantage because once one player reaches the goal score, the remaining players in the round get a last chance to top it). 1,2,3,4,5,6 - you immediately get 2,500 pts. Three pairs (e.g. 2,2,4,4, 5,5) - you immediately get 750 pts. Barring those situations, a 1 gives you 100 pts, and a 5 gives you 50 pts. No other numbers give you any points. You must gain at least 250 pts in order to stop rolling on your turn. For example, if you roll once and get (1,2,2,3,4,4) you have scored 100 pts. You must remove the 1 from the mix and continue rolling until you score at least 150 more pts. 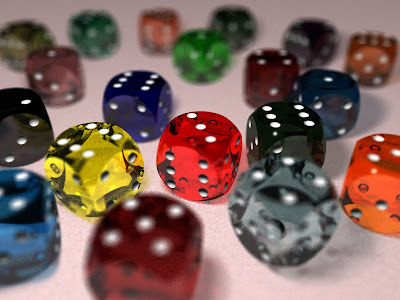 If on your second roll, you roll (2,3,4,5,5), you have the choice to remove both 5's (for 2 x 50 pts) or just one of them, although you must remove at least one die each roll. Now, here's the catch: If, on your third roll (having opted to remove both 5's), you roll (2,4,4) you have scored no points on a roll. This is called getting a "crappy", and you automatically lose all of the points you have scored on that turn (In this case, 200 pts). If you get 7 crappys, you lose 1000 pts. However, if on your first roll of any turn you roll a crappy with all six dice (e.g. 2,2,3,4,4,6), that is called getting a "crappy malappy". If you get two crappy malappys in any game, you automatically win, and no one gets a chance to rebut. Alternatively, let's go back to your third roll (you have already rolled a 1,5,5 for a total of 200 pts.) Let's say instead of getting a crappy, you roll (4,4,4), for 400 pts. You have scored a total of 600 pts. and you get all the dice back. Now you must roll a minimum of 250 pts again, in order to keep your points. I'm in California this week to help my friend, Lea, make the final preparations for her wedding this weekend. In honor of this auspicious occasion, and because this is our last wedding of the season, I have decided to make this "Wedding Week" on the blog. Don't worry if you aren't a bride- or groom-to-be, however -- I'll try to make this week's post applicable to the soon-to-be-hitched, already-wed, and don't-believe-in-the-institution-of-marriage, alike. Today's topic: tasty cocktails. I love flowers. I love growing them, picking them, smelling them, wearing them in my hair, displaying them around my house. I love all of them: from expensive orchids to clovers that grow like weeds in the park. And, for crying out loud, my name is Lily. So naturally, when Lea told me that she planned to arrange the flowers for her wedding herself and asked if I would help, I said an enthusiastic "yes". Lea is by nature very laid-back and I knew she wouldn't expect, or even want, Florist-like perfection from the flowers we arranged. She even chose to buy all of them at the local Farmer's Market, opting to be surprised and use whatever was available at the time, rather than order specific varieties ahead of time from a floral supply. Here are the basic instructions for how to make beautiful flower arrangements for special occasions or just everyday loveliness. All of that said, ladies, unless you have an equally laid-back attitude, and a friend who loves flowers as much as I do, I don't recommend trying this for your own wedding. 1. When buying flowers, try to choose blooms within a complimentary group of colors. 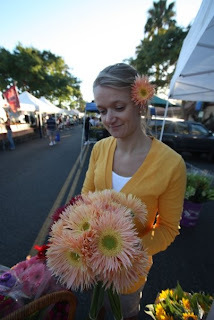 Also, make sure to buy some big, showy blooms, like large roses, dahlias, or these pretty Gerbera daisies I am picking out at the Farmer's Market in the photo at right, some smaller blooms (like spray roses or cosmos), and some foliage to fill in. 2. Choose your vessels thoughtfully. 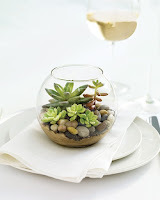 Low vessels are great for holding tight ball-shaped arrangements like that at top. Or, if you want something tall and dramatic, obviously choose a vase accordingly. 3. Fill the vase about 3/4 full with room-temperature water. If you are preparing arrangements in advance for an event, use cold water to keep the blooms fresh. If the flower-seller gave you flower food, put that in the water. 4. Start with the large blooms. 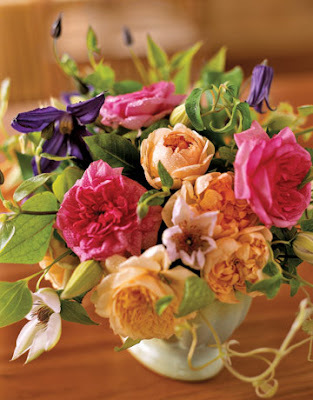 Cut each stem to the length where it will fit attractively in the vase, arranging each bloom so there are some facing in all directions, making the arrangement attractive from all sides. 5. Fill in the spaces between the large blooms with the smaller blooms. Then, fill in the spaces between the smaller blooms with the foliage. Rotate the arrangement one last time to make sure it looks good from all sides. If anything is sticking out too far, trim the stem to make things even. At the cocktail hour at their wedding on Saturday, my friends Lea and Erik are offering guests two signature cocktails: her favorite: the Ginger-Pear Martini, and his: the Dirty Martini. If you've never had these delicious libations, you are missing out. Luckily for you, you don't have to be invited to the wedding to enjoy one of them -- any after-work shindig or weekend night will do. Either could be just what you need to warm your blood on a cool autumn night. Or do what Erik and Lea are doing, and serve both. Just be careful: These taste so good you might be tempted to overindulge. Trust me: I helped test the recipes. Pour all the ingredients over ice, shake and strain into martini glasses. Garnish with a slice of fresh pear, if desired. 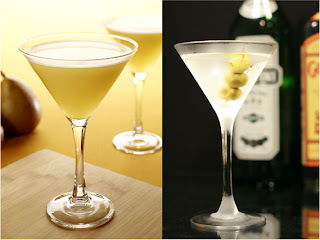 Pour vermouth into two chilled martini glasses, swish and pour out extra. Combine vodka and olive juice over ice, shake, and pour into glasses. Garnish with two olives, of course. I'm in California this week to help my friend, Lea, make the final preparations for her wedding this weekend. In honor of this auspicious occasion, and because this is our last wedding of the season, I have decided to make this "Wedding Week" on the blog. Don't worry if you aren't a bride- or groom-to-be, however -- I'll try to make this week's post applicable to the soon-to-be-hitched, already-wed, and don't-believe-in-the-institution-of-marriage, alike. Today's topic: what to wear almost anywhere. If you've ever been the gal at the party wearing jeans when everyone else is in a dress, the dork in the jacket and tie at the pool party, or the chick whose 5-inch heels keep sinking in to the dirt at the backyard barbecue, you know the shame and discomfort of being inappropriately dressed for an occasion. Even if you're one of those disdainful-of-fashion-and-propriety types (in which case, what are you doing reading this blog - are you lost or something? ), you have to admit that sometimes the right outfit can be a major boost to your confidence and ease, and the wrong one can pretty much ruin your night. All of this is made more complicated by the cryptic and inscrutable dress codes some people choose to assign to their events (what the heck is 'Dressy Casual'?) The only thing worse being when they don't assign one at all and you are left to guess. Happily, my friend and yours, Emily Post, has gone to the trouble of clearly identifying all of the different dress codes that might be ascribed to a party, and outlining precisely what you should wear (and I have taken the liberty of unlawfully copying her work below). I don't agree with everything she says (I tend to think "holiday-themed ties" are a "no" in every circumstance. But first let's address what you should (and should not) wear if no dress code is mentioned. -In the Daytime: Ladies: a short, colorful dress or suit is appropriate. Don't wear black, or flashy sequins or beads. And consider the location; if the wedding is to be outdoors in a garden or on a lawn, you will be happier in flat footwear or wedges than in stilettos. Guys: Dress shirt and pants, with a sports jacket. Tie is optional. -In the Evening: Ladies: Cocktail dress. Black is fine, white is not. Nothing too flashy or revealing, please. You don't want to draw attention to yourself in a negative way (if you have to ask if it's appropriate, it probably isn't). Guys: Suit or dress pants and jacket. I strongly suggest a tie. 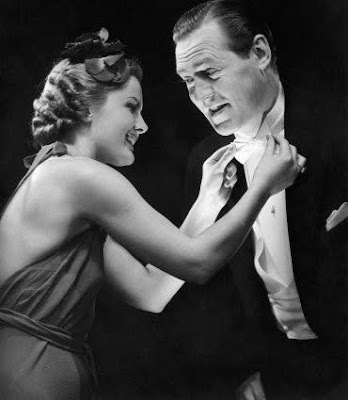 Don't wear a tuxedo unless "black tie" is specified. -Outdoors in the Spring or Summer: Ladies: A summery dress and sandals. Guys: Khaki pants and a polo shirt or light cotton dress shirt. Unless you're on Bermuda, stay away from shorts. -In the Evening in the Fall or Winter: Ladies: A short cocktail dress (duh), with dressy shoes. Guys: A jacket and tie, unless the host or hostess specifically mentions the word "casual". black tuxedo trousers plus other black tie wardrobe. Clothing is the same as for 'Business Casual' with some holiday colors or designs. I'm in California this week to help my friend, Lea, make the final preparations for her wedding this weekend. In honor of this auspicious occasion, and because this is our last wedding of the season, I have decided to make this "Wedding Week" on the blog. Don't worry if you aren't a bride- or groom-to-be, however -- I'll try to make this week's post applicable to the soon-to-be-hitched, already-wed, and don't-believe-in-the-institution-of-marriage, alike. Read on, lovers. Lea's wedding this weekend is going to feature a jazz trio during the dancing portion, but for the cocktail hour, we're just using an iPod to create a fun, festive mix of background music. 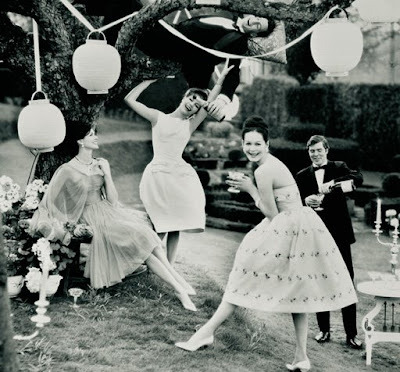 And, in fact, I have long worked to create the perfect cocktail-party playlist that is diverse across genres and peppy enough to get the party going, without distracting from it. There is a fine line between songs that feel happily ambient and background and those that make you feel like you're in an elevator. But it's also important that the music encourage conversation and mingling, and not make you feel like you need to pay attention to it by bopping your head or singing along. Trust me, I've thought about this a lot, and it's easier said than done. So I view this weekend's festivities as a challenge and an opportunity. Here is a list of some tunes (about three hours' worth) that I think have what it takes. There's a little Big Band, a little Latin, a little Motown, and even a little fat Hawaiian Elvis. If they do their job, they will put you in a jubilant, outgoing mood, without you actually, you know, noticing them. My bedroom in my first rental apartment (c. 2004). Note the painted walls, rug, framed art, curtains, headboard and pretty lighting fixture. Ignore the copious amounts of toile - it was a phase I was going through. Okay, so, if this isn't your first time reading my ramblings, you probably already know that my husband, JM, and I bought our first apartment last year and are reveling (okay, and sometimes kicking ourselves) in the process of fixing everything up just how we want it. But, what you probably don't know is that we weren't always fancy homeowner types. In fact, before this we wallowed away five years in a rental apartment, which had a lot of quirks we had to learn to live with, and that we did our best to overcome (for instance, a galley kitchen with literally no counter space* - and I mean that "literally" literally). But what I discovered during those years was that just because you live in a rental doesn't mean you can't personalize and decorate it to your tastes. With a little imagination, and a little elbow grease, any rental can be made to feel like home. And while most of these fixes are inexpensive and some are a little more pricey, they are worth the investment because almost all of them can be removed, packed up, and brought with you to your next rental. So get to it, and make yourself at home. 9 Ways to Personalize A Rental Apartment (Without Losing Your Security Deposit). 1. Watch Paint Dry: Nothing says "boring rental apartment" like plain white walls. Your rental agreement may forbid you to paint them another color, but that doesn't mean you can't change them now and then change them back before you move out. If you are going to be living in your place for a year or less, it's a lot of work to paint a whole room (although not as much as you may think- it only takes an afternoon), but you might consider painting just one wall a bold color, like red, to make a real statement. Putting a pretty color on the walls is the fastest and easiest way to make an apartment feel decorated and homey. And it can cure all kinds of problems: We painted our living room a soft sunny yellow, and you could hardly tell that it was 36 square feet and had no windows. Well, at least it helped. 2. Take the Floor: Another dead giveaway of a standard-issue rental is a standard-issue parquet floor. There's nothing wrong with wood flooring, but in most rentals the the floors have taken a sustained beating over the years and have become severely worn and scuffed. Cover those spots with soft, comfortable rugs and you'll feel like you're in a cozy cottage as you pad your way to the bathroom in the middle of the night. Click here for my tips on successful rug-buying. 3. Get Framed: If you are over the age of 20, and no longer live in a dorm, I must implore you to stop putting unframed things on your wall. You can find inexpensive standard-sized frames to hold you photos, posters and other artworks at any homegoods store or Walmart/Kmart/Target. Or look into removable wall decals. Just make sure you put something on the walls, or it will feel like you 're living in an institution. Click here for more of my arty suggestions. 4. 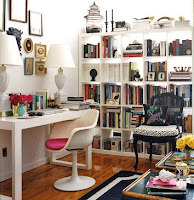 Built-In Style: If you want your apartment to have that "a smart person lives here" look, you are going to need to find a place to put your books (other than in piles under the coffee table). For tons of extra storage, you can fake the look of built-in bookshelves with large bookcases that take up a whole wall. Check out the "Expedit" from Ikea (at right), or the inexpensive offerings from Gothic Cabinet Craft. 5. Bed of the Class: Your bedroom should be more than just where you sleep and leave your clothes on the floor. It should be your sanctuary; your den of relaxation and meditation. And that all starts with your bed. For crying out loud, buy yourself a decent mattress and sheets, and make your bed look like something. I recommend buying an inexpensive headboard, or using this pillow trick to fake the look of one. I also love a good swing-arm lamp beside the bed to make your boudoir a comfortable and functional place to work and read. And they mount to the wall with just a couple screws and plug in (no electrical work required). 6. Light It Up: Most rental apartments come with some seriously unpleasant lighting. If it's not ugly fluorescent ceiling fixtures, than it's too-bright bathroom lights that emphasize your flaws and make you feel like death warmed over as you head out the door to work. Believe it or not, changing out the light fixtures and installing dimmer switches in your apartment is a relatively easy process, which has a huge impact on the overall feeling and mood of the place (imagine leaving for work every morning feeling smokin' hot, instead). You can find great cheap fixtures on eBay. Just remember to carefully save and store the old fixture so you can reinstall it when you move out. 7. Hardware The Heart Is. A lot of rentals have god-awful kitchen cabinetry and closet doors. While changing those parts falls far into the "not worth it" category, you can put lipstick on the proverbial pig by changing out the hardware. You'd be surprised to see what a huge difference a cute knob or drawer-pull can make. Click here for great resources. 8. It's Curtains for You: Most rental apartments don't come with drapes (usually they have infuriating malfunctioning dusty blinds, if anything). So if you would like to avoid providing a free peep show to the neighborhood, you are going to have to hang something anyway. Luckily, a pretty curtain rod with some simple drapes can do a lot to create ambiance in a room (heavy pleated ones give an air of old-fashioned sophistication, light-colored sheers are soft and beachy). Look on eBay for pretty ones from Pottery Barn or Restoration Hardware for cheap prices. Or try your hand at sewing some. 9. Bloomin' Beautiful: If you want your apartment to feel like a place where people really live, it helps to have some real living things in it. A few well-selected houseplants can go a long way toward making an apartment feel warm and alive. I suggest a long-living orchid, a hard-to-kill succulent, or a self-maintaining terrarium like that at right. *Oh, and if you are wondering what I did to make that counter-less kitchen work, I bought this over-the-sink cutting board and this Ikea chopping-block cart. Intsa-kitchen. Working from home is not always easy. I mean, my life is pretty easy, but actually getting work done at home can be difficult. There are always dishes and laundry to be washed, a dog to be walked, a run I'm putting off, and a million random household or work projects calling my name. You might think that, being home all day, the days would just drag on and on for me (and I admit that was a concern for me when I left my full-time job) but it turns out that couldn't be further from the truth. By the time I get all those things checked off my list, eat something for lunch (like today's overly-toasted hamburger bun bottom) and post to the blog, I'm stunned to realize my husband's workday is almost over, and I have to quickly clean up the mess I inevitably made with that day's project and come up with something quick to make for dinner. Sometimes, I can't even get it all done in time, and things slip through the cracks - like that run. Or showering. Or, today, getting my blog post up before 4 o'clock in the afternoon. Luckily, I have discovered some really wonderful products that help make it a snap to throw together delicious, nutritious dinners in short time (sparing my poor husband from whatever other nonsense I might dig out of the fridge). 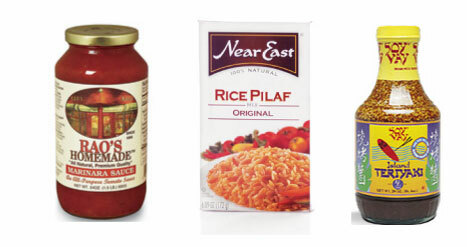 Here are three wonderful products that I always keep stocked in the fridge or cabinets for those last-minute meals. They beat charred mateless bread products by a long shot. Near East Couscous and Rice Pilaf: I am a huge fan of this whole line of products and we eat them all. My absolute favorites, though, are the Parmesan Couscous and Original Rice Pilaf. Both are great as a side to any chicken, fish, or meat and can be whipped up in a snap. Rao's Homemade Marinara Sauce: I mourn the years I wasted cooking with supermarket-brand tomato sauce, before I knew about this stuff. It's a little more expensive, but it's completely all-natural and fresh and galaxies better than any other jarred tomato sauce I have ever tasted. Lightyears better. (Here's a tip: buy it at Whole Foods; it's about $2 cheaper there than anywhere else). In a pinch, I chop up whatever veggies are in the fridge, mix them with this sauce and spoon it over couscous or pasta. Or I use it to whip up this rustic eggy deliciousness. Yum. Soy Vay: I love these sauces- no freaky preservatives or junk, and so tasty. I use the Island Teriyaki to quickly marinate chicken or fish before throwing it in the oven or on the grill for 10 minutes. Voila- dinner is ready (even if I never am)! A wise man once asked, "Do you like Piña Coladas?" And I do, as well as a whole host of other things that feature delicious, juicy, lovely, tropical pineapple as a main ingredient. And pineapple is actually a very healthy food (full of enzymes and vitamin C), and surprisingly cheap, so long as, instead of buying the conveniently pre-cut pineapple chunks, you buy the whole fruits and cut them up yourself. It only takes a few minutes, and much like opting for full heads of lettuce over pre-washed plastic clamshells, this one simple change will save you a lot of change (and some bills, too). And it's better for the environment because it eliminates the use of wasteful single-use plastic containers. The problem I've found, however, is that the persnickety pineapple happens to be one of the most difficult fruits to dismantle properly. Happily, I believe I have finally mastered this skill, and you can too (so long as you have half a brain), so I've created step-by-step instructions to help you tame this spiny beast yourself. Once you've conquered this skill, we can reconvene to discuss our mutual feelings on getting caught in the rain and the pros and cons of making love at midnight in the dunes of the Cape (i.e. errant sand). But, for now, just stick with the pineapple. Step 1: Using a large knife (please don't attempt this with some rinky-dink steak knife -- get out the big guns), cut the top and bottom off of the pineapple, creating a level surface on the bottom. Step 2: Place the pineapple upright on it's flat bottom. Use the knife to cut the exterior off in strips from top to bottom, cutting just deep enough to completely remove the eyes at the center of each strip, leaving edges where the strips have been removed (don't worry about these corners- you will come back and get them in the next step). Step 3: Cut thinner strips from top to bottom, at the edges of where the first set of strips met, all the way around the pineapple, cutting just deep enough to remove the remaining eyes. (See? - I told you you would get them all eventually). Step 4: Slice all the way through the pineapple from top to bottom, cutting just to the side of the pineapple's woody center. Step 5: Repeat step 4 with the remaining sides, until all of the flesh is cut away from the woody core. Discard the core. Step 6: Cut the pineapple's flesh into slices or chunks (whatever your preference). It wasn't supposed to be like this. I started out life as sort of a messy, carefree child, with twigs stuck in my bowl-cut and my overalls caked in mud. And I still like to think about myself as a fairly laid-back person (to wit: I sometimes stay in my pjs all day. I rarely vacuum. I enjoy beer). But I fell in love with a military man, and some part of that OCD seems to have rubbed off on me and sunk in real deep. And now, I have to admit, there are certain things about which I have become an absolute stickler. One of those sticking points is the proper way to set a table. I know, you're probably thinking, "Oh, who cares, so long as there's a plate, a cup, and some sort of utensil with which to shovel the food into my gaping maw?" But the answer is: I care. And so does the rest of polite society. And so should you. Therefore, as the kindly hotel concierge teaches Julia Roberts table manners in Pretty Woman, so shall I do for you (just don't expect me to rescue you from that lecher, Jason-Alexander-before-he-was-George-Costanza.) But I digress. F: for Fork (the salad fork goes outside the regular fork, if you are using both). O: is for the round plate (okay, that one's a stretch, but I know you can handle it). See? That wasn't so bad. Nice try, Emily, but like most mnemonics, this one is slightly flawed: It leaves out the napkin, which goes to the left of the plate, underneath or inside the forks. It also can go on top of the plate if you are going for a jazzy place setting look, or want to try out a pretty napkin fold, but let's just stick to the basics for now. Let's try another memory device, shall we? To remember the placement of the drinking glass and bread plate, just hold your pointer fingers out and touch your thumb to your other fingers. Your left hand will take the shape the letter "b" and your right hand will look like the letter "d". This indicates that the bread goes on the left and the drink goes on the right. This comes in handy at other times, too: I frequently do this under the table at weddings and fancy restaurants to keep myself from inadvertently stealing the bread or drinking from the wine glasses of my dining companions. Now, as they say, you are all set.